No billion-dollar car manufacturer ever made it to the top without a little ingenuity. To stay on track and deliver their product to dealers, the manufacturer came up with a splendid plan to accelerate assembly. When the supplier was finally able to deliver the parts to complete assembly, the manufacturer intended to double up on the assembly line process by forming two separate lines for production. They planned to add a temporary structure on the campus as a second assembly line. Once complete, they would simultaneously run two assembly lines of SUVs. Mahaffey had a history with the manufacturer and had helped them overcome similar issues at another assembly plant. The relationship was a good one, and the final result of our prior work with the company was excellent. Mahaffey received the assembly line project based on our past relationship, our outstanding reputation in the industry, professional installation teams, project managers, and portfolio of successful projects. The challenge was a race against time for the manufacturer. Once the parts arrived, they planned to add them on for final delivery as quickly as possible. It was a very tight timeframe. The requirements included a structure that resembled the layout of their current assembly line facility. They needed to park the vehicles, install the final parts, then roll the vehicles out quickly onto the lot. Space would have to allow for easy repetition of the process until all of the SUVs were complete. Additionally, the space required was estimated to be 4,000 sq. feet and would need to include a customizable interior and accommodate the flow of the assembly line process. Other requirements included, personnel doors, vehicle “garage” doors, and LED lighting. Could handle wind loads required for the county. Had approximately 4,000 sq. feet of space. Could be installed quickly over asphalt. Could remain onsite 3 months. Mahaffey promptly came back with a design proposal that fit the manufacturer’s timeframes. After consideration, our team proposed Mahaffey’s MegaStructure™ . 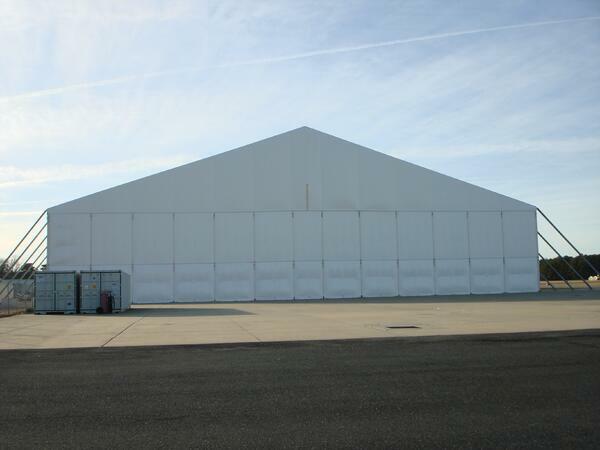 The MegaStructure™ is an industrial fabric structure perfect for quick turnaround needs and large projects. It is also ideal for locations with harsh climate conditions like high winds and heavy rain; the aluminum box beam is rated to withstand winds up to 130mph. Mahaffey’s proposal included an explanation of customized features that would help the workflow inside the structure. We outlined how moving the center beam would allow better interior utilization of the space for the assembly process. There would be a station for assembly on each side. We recommended centering the roll-up doors to allow the vehicles to exit without impacting work on either station. Moving the center beam opened up a wide aisle for vehicles to use as a drive through down the middle of the structure. Drivers were able to pull vehicles away from the stations, head straight down the center and exit through the roll-up door. The final structure was 4,356 sq. feet and included two personnel doors, two roll-up overhead doors, and an LED lighting package. The final proposal came complete with a three-day installation timeline. Mahaffey’s mobilization on the assembly line project is an impressive example of how quickly our team responds, and how important it is to meet our clients’ goals. In this case, the client’s short timeframe meant we needed to have our installation team on site three days after the contract was signed. The contract was confirmed on a Friday, and we began installation the following Tuesday. We finished the installation four days before the assembly plant had requested. Mahaffey’s ability to quickly mobilize and maintain our proposed timeline allowed our client to fulfill their promise to deliver a stable of shiny new vehicles on time. Mahaffey finds solutions to whatever the situation may be. We have years of experience setting up innovative, custom solutions, and we can mobilize and execute in a few days. To learn more about Mahaffey's MegaStructure™, or if you are looking for a partner that’s quick, reliable, and professional, call Mahaffey’s expert project managers today.